We enjoyed our weekend in Coimbra. 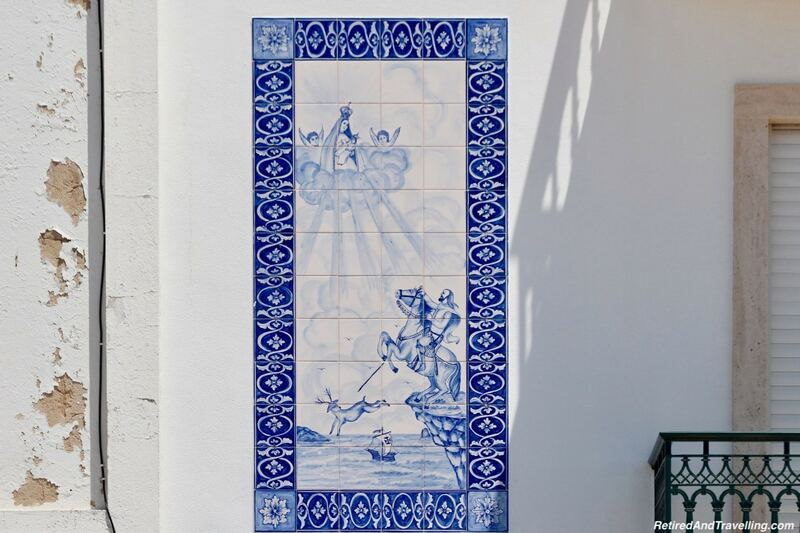 It was time to move to our next stop to stay in the walled city of Obidos. 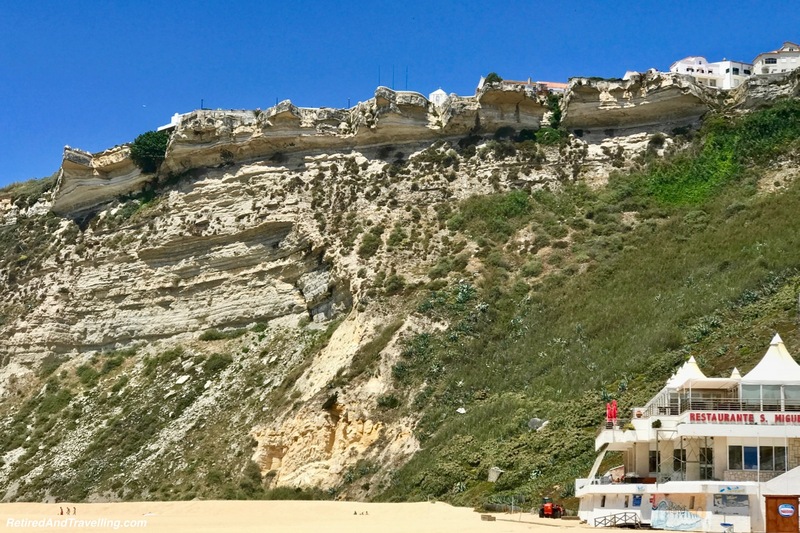 But not before a stop at the beach town of Nazaré! But not all aspects of travelling in Portugal for 4 weeks was fun and exploration. We desperately needed to do laundry. There had been no real opportunities on our previous stops. But we figured that a university town like Coimbra would have self-serve laundries. We tried the first two that seemed to be within walking distance. Neither of them were really laundries. We had one more marked on our path out of town. It was a working day and parking was crazy when we finally found the laundry. David waited in the car while I figured out the instructions and got our wash going. I didn’t quite understand the pricing plan and ended up paying for a much larger load than we actually had. I did much better on the dryer instructions. But for less than 15€ we had all clean laundry. We were ready to move on. 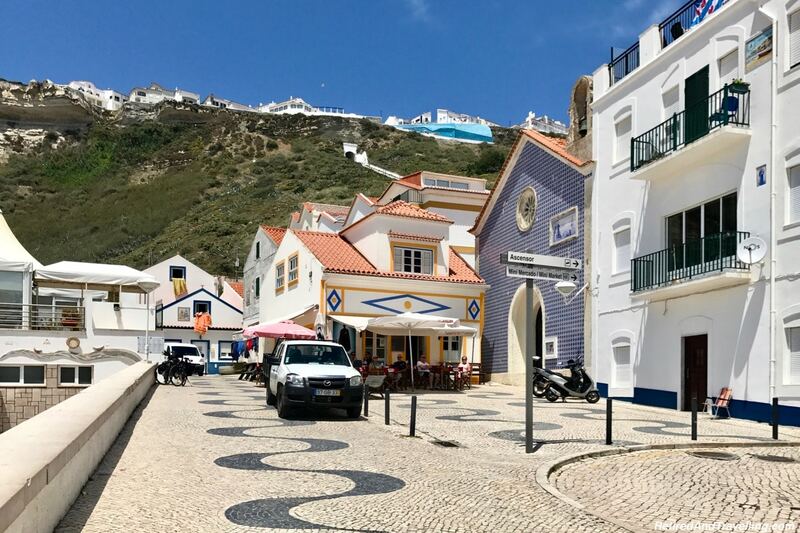 The beach town of Nazaré was on my list for fresh seafood. 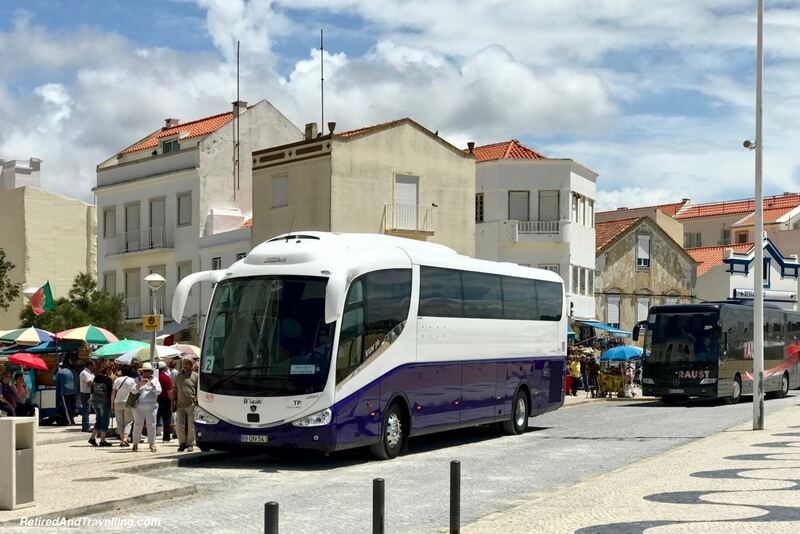 Since we had left Coimbra at a reasonable hour, we thought we had time for one stop before we moved on to our stay in Obidos. Ignoring the highways we took the smaller roads to get to Nazaré. The research we had done suggested it was a small fishing village. We drove through town towards the beach and finally found parking on the street. 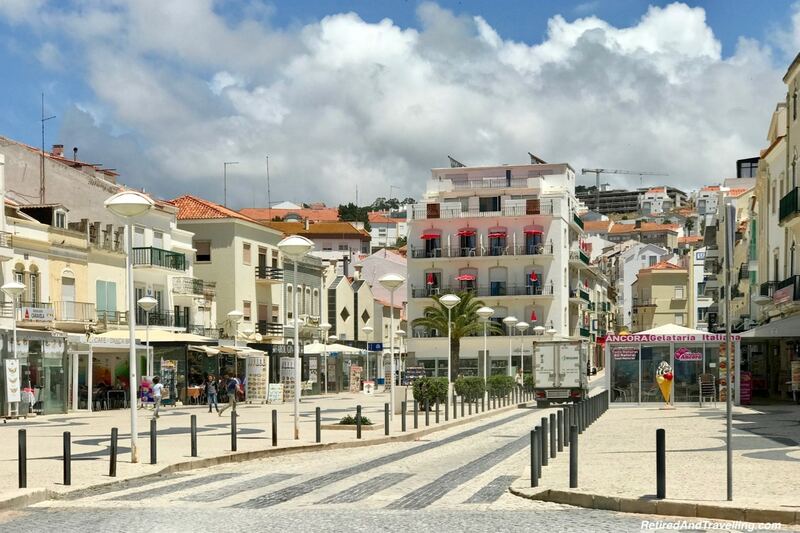 Our plan was to enjoy the beach town of Nazaré. But when we walked to the beach, we found out why the town seemed so busy. 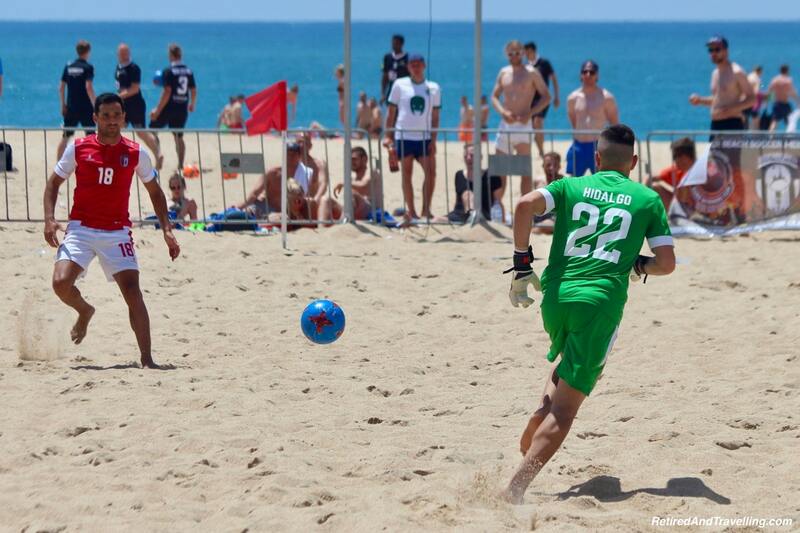 There was a large beach football (soccer) tournament being held on the beach. But we also saw bus after bus of tourists pour into the beach. This seemed to be a stop on a tour of areas outside of Lisbon. We followed the bus crowds around the small town. 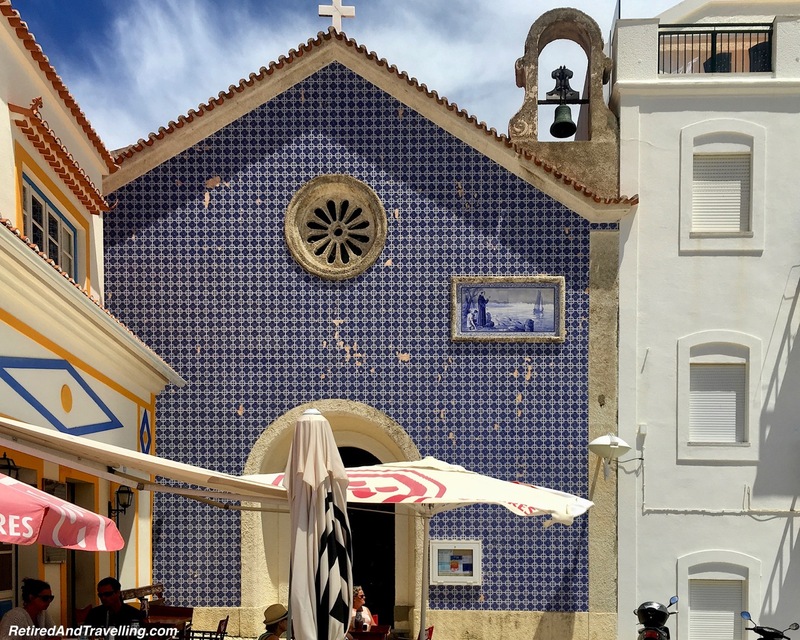 Parts of the beach town of Nazaré were old, historic and quite quaint. But the main beach road was also filled with typical souvenir and beach junk shops. 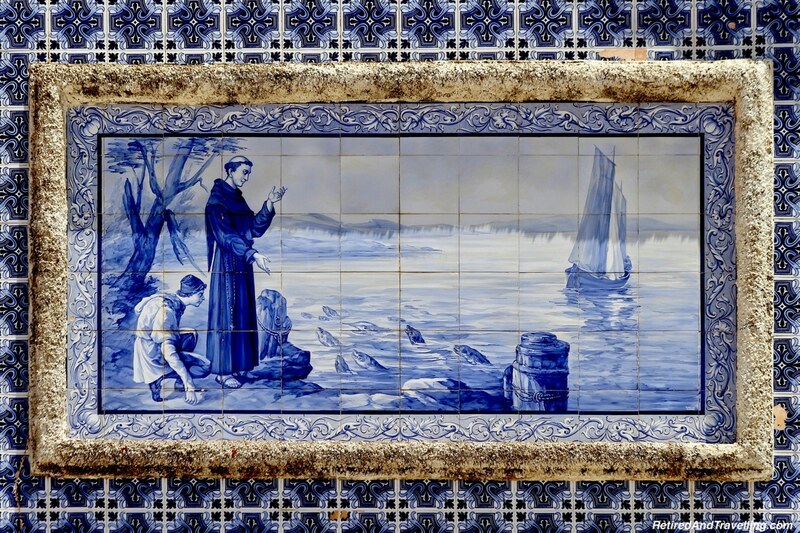 We saw more of the artistic tiles that decorate the inside and outside of towns of Portugal. 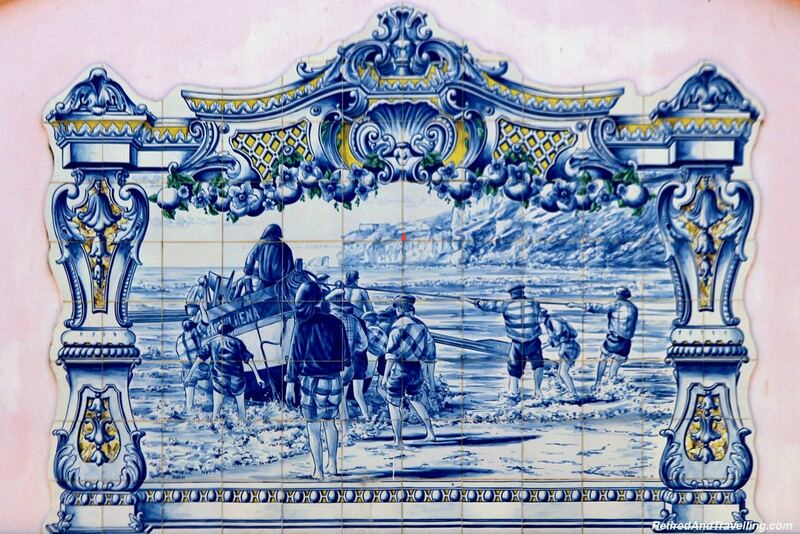 But nothing quite as elaborate as the tile art that decorated the buildings of Porto. On one end of the town was a high cliff. There was a funicular or some kind of tram that got people up to the higher levels. 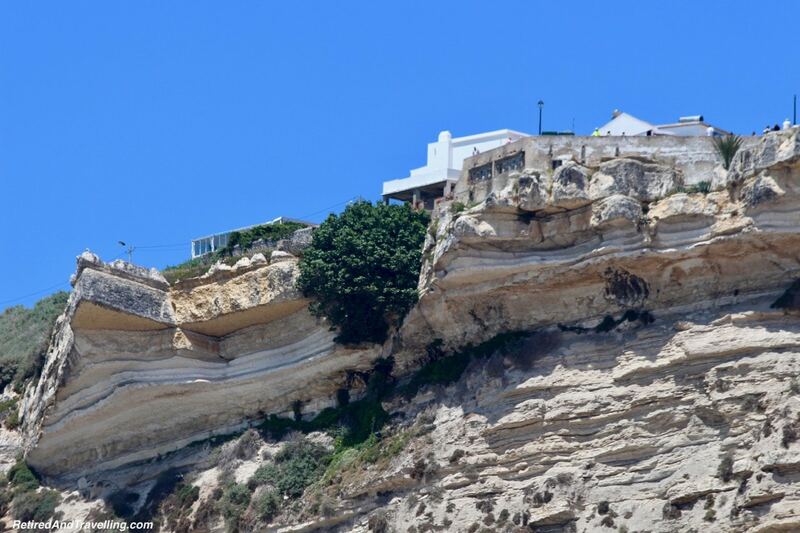 We wondered about how the houses could be built so close to the edge. 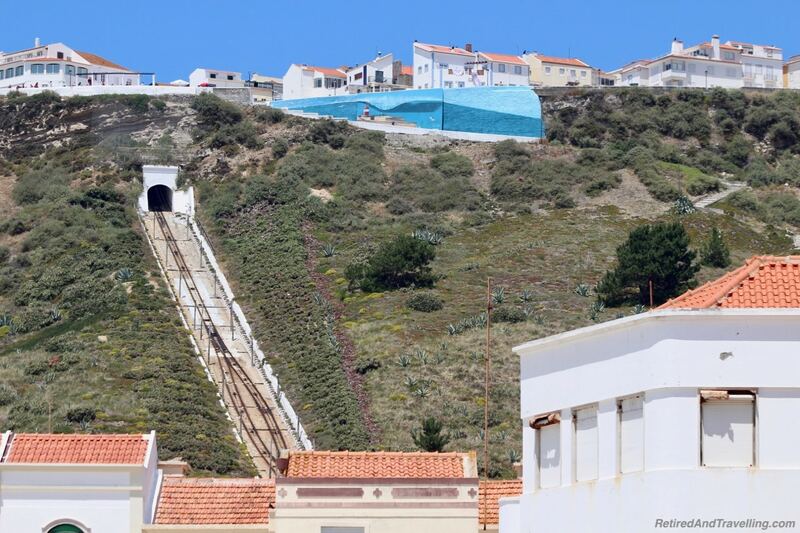 On the other end of town you could see a long sandy stretch where people could enjoy the beach at Nazaré. Beyond that was a modern dock filled mostly with pleasure boats. 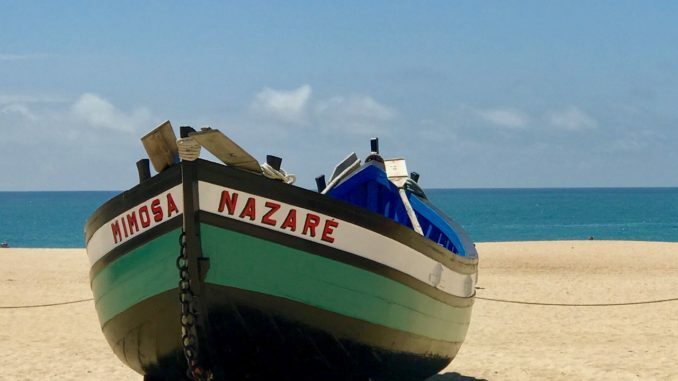 We never did find the small fishing village that had drawn us to Nazaré. We had watched a travel Rick Steves travel video on Portugal before we left home. He talked about finding a room to rent from old ladies who drew in customers off the street. 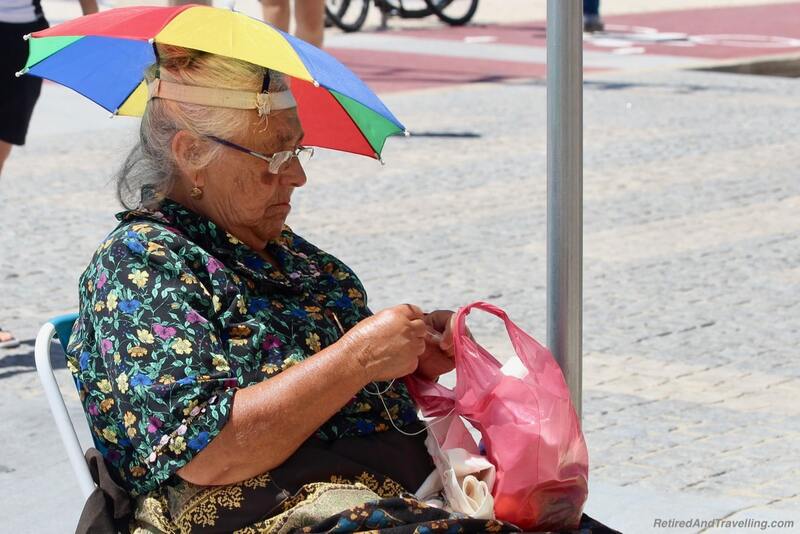 We were amused when we then saw several old women set up on the sidewalk. 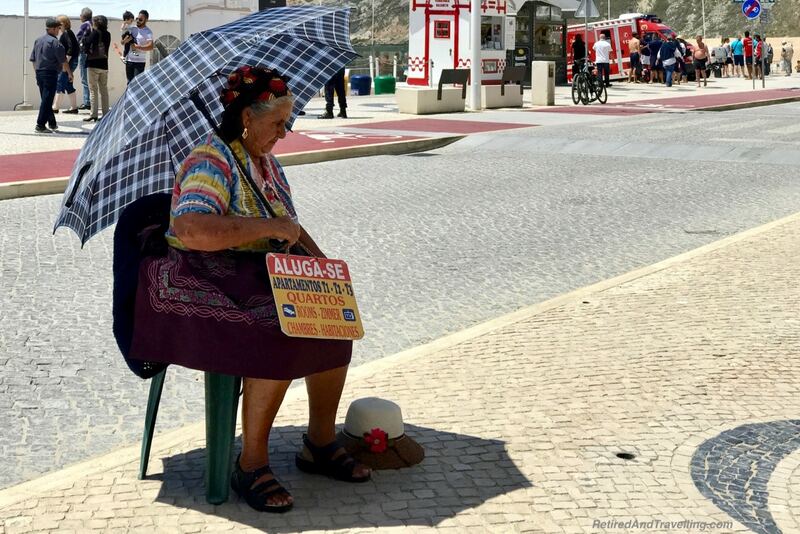 Their signs said they had rooms to rent in the beach town of Nazaré. We saw fishing boats hauled up on the beach in Navare. They did not look like working boats. But if we didn’t find the fishing boats, we did find fresh seafood. 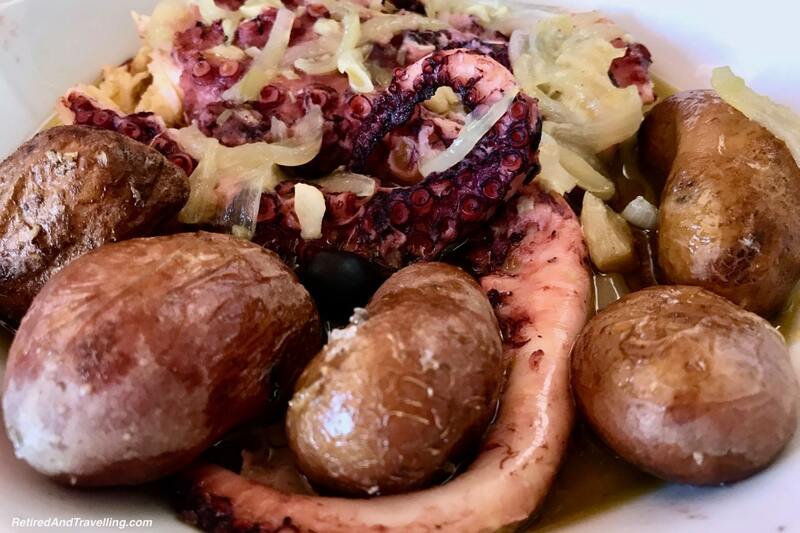 Octopus had been a great hit every time I tried it in Portugal. Lunch at Restaurant Adega Oceano would not disappoint! 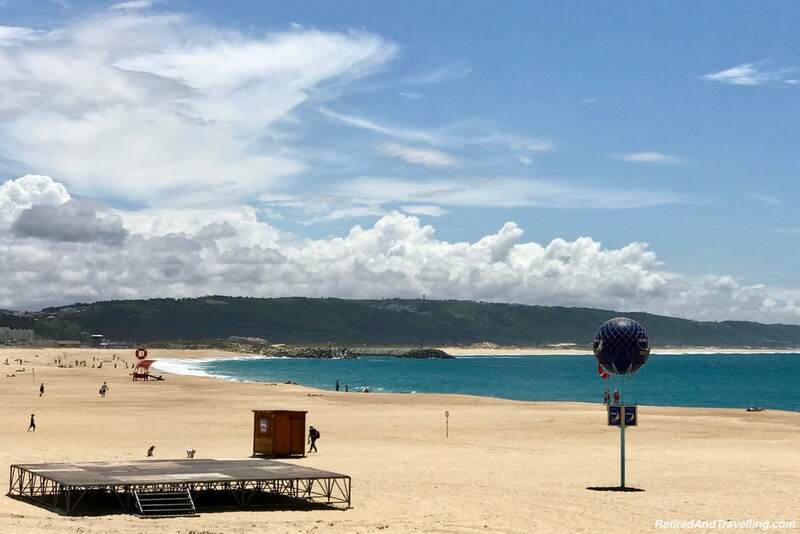 After our quick stop to enjoy the beach town of Nazaré, we were on the road again to our next stop in Obidos. We were not sure if we would make it back to actually get in the water and try the beach. 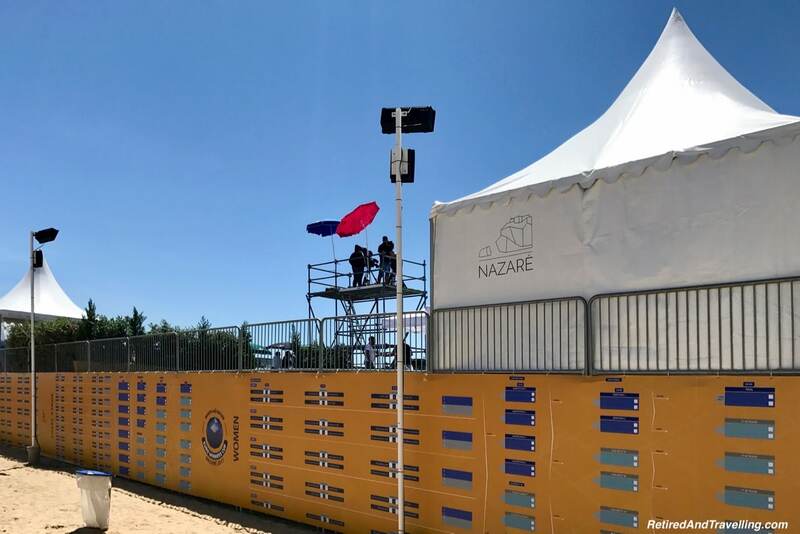 But would plan to stop for the beach in Navaré if we were ever back in this area. 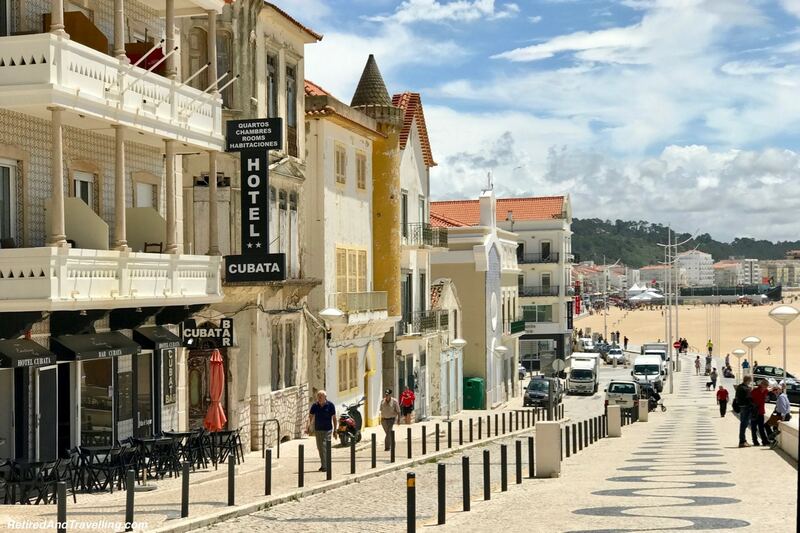 Did you enjoy the beach town of Nazaré? 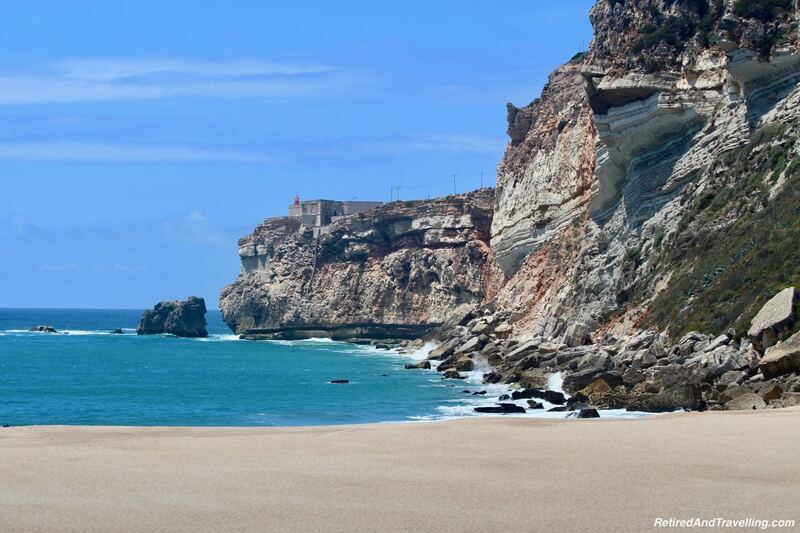 Did you find it a quiet little fishing village or a bustling beach town?